Positector RTR Replica Tape Reader measures and records peak to valley surface profile height using replica tape. Display Languages: English, French, German, Spanish, Japanese, Chinese, Korean, Dutch, Portuguese, Italian, Norwegian, Russian, Czech, Polish and Turkish. PosiSoft 3.0 - desktop software (PC/Mac) for downloading, viewing, printing and storing measurement data from PosiTector gauges. No internet connection required. ALL GAUGES COME COMPLETE with body and probe, stainless steel burnishing tool, cleaning cards(5), check shim, surface cleaning putty, protective rubber holster with belt clip, wrist strap, 3 AAA alkaline batteries, instructions, nylon carrying case with shoulder strap, protective lens shield, Long Form Certificate of Calibration traceable to NIST, USB cable, PosiSoft.net account, two (2) year warranty. 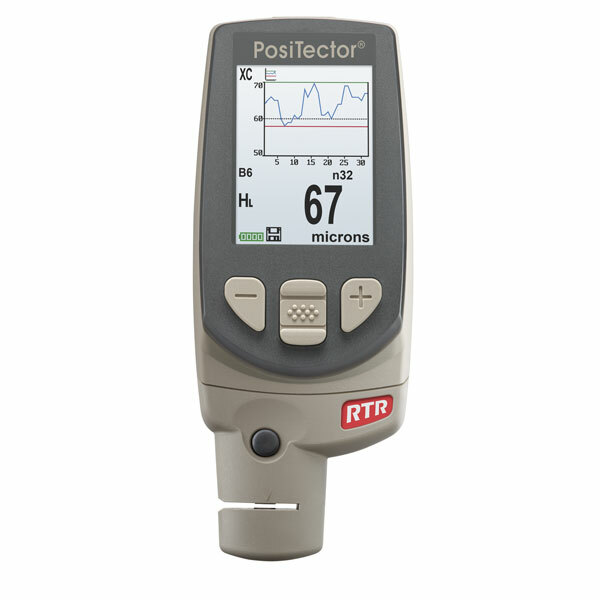 Is the PosiTector RTR H calibrated at the factory? 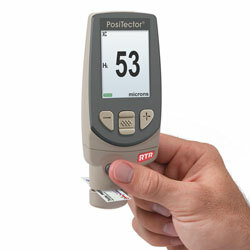 The PosiTector RTR arrives fully calibrated and ready to measure. A Long-Form Certificate of Calibration traceable to NIST is included, which documents actual readings taken by your instrument at our calibration laboratory on standards traceable to a national metrology institute. Beware of ‘Certificates’ or ‘Certificates of Conformance’ offered by competitors. These typically do not include actual instrument readings, and are often insufficient to meet common quality requirements. Verification of gage calibration and accuracy can be performed with the supplied check shim, which is specifically intended for all PosiTector RTR probes. Replica tape is a long-known method for characterizing a surface. It is simple, relatively inexpensive and shows good correlation with results from other methods. It has the advantages of ruggedness, relatively low start-up cost, good repeatability and the option of retaining a physical replica of the surface being evaluated. The method is widely used and widely understood. It is particularly useful for measurements on curved surfaces that are difficult to measure directly with other instruments. It is therefore not surprising that it has become the most popular field method for measuring surface profile. Its operation is described in a number of international standards including ASTM D4417, ISO 8503-5, NACE SP0287, and AS 3894.5. What grades of replica tape is the PosiTector RTR H compatible with? The PosiTector RTR measures the two primary grades of replica tape: Coarse and X‐Coarse. The other grades of replica tape, Coarse Minus and X‐Coarse Plus, are check grades that are used only to confirm or improve the accuracy of conventional analog spring micrometer measurements at the lower end of the Coarse tape’s range (Coarse Minus) and at the upper end of the X‐Coarse tape’s range (X‐Coarse Plus). Since the PosiTector RTR automatically corrects for the non‐linearity of Coarse and X‐Coarse tape, these other check grades are not required. 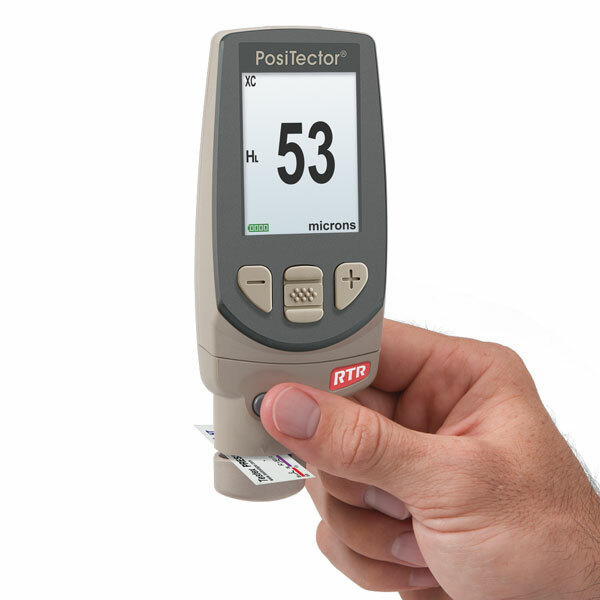 Why should I purchase the PosiTector RTR H over a conventional snap gage? -Linearization feature increases measurement accuracy and reduces tape consumption. -Unique opposing spring design prevents undesired user interferences from occurring. -Large digital display for clear, easy-to-read measurements with the ability to store and download readings. 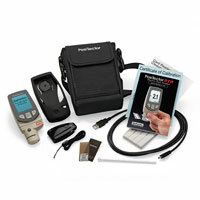 -Arrives fully calibrated and includes a traceable calibration certificate. -Interchangeable probe design offers the ability to use a single PosiTector gage body for a wide variety of applications: surface profile, coating thickness, wall thickness, salt contamination, Shore hardness and environmental. Is the PosiTector RTR H as accurate as conventional spring micrometers? The PosiTector RTR’s displayed HL (linearized height) value is a more accurate surface profile measurement because it adjusts for tape non‐linearity without the need to average the results from 2 or more replicas. Linearization is a technique used to insure uniform accuracy of measurement in many types of advanced sensors. Its use in connection with replica tape is described here. 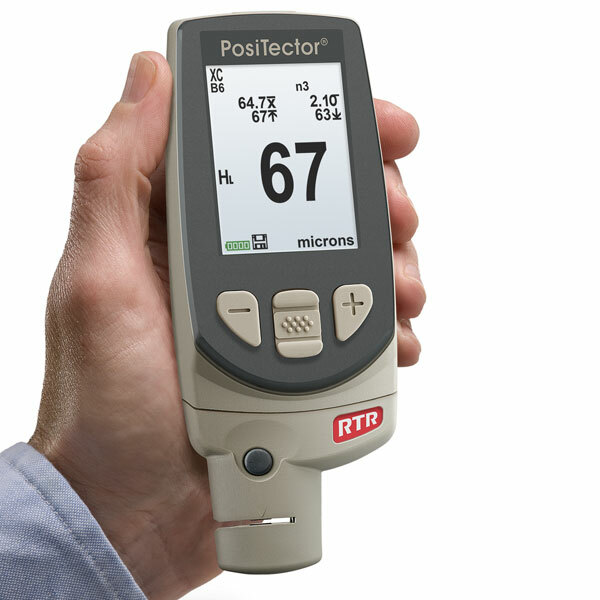 Do I need to take two measurements in some surface profile ranges with the PosiTector RTR H, as is required with the spring micrometer? No. With a single measurement, the gage produces a more accurate peak‐to‐valley height measurement HL. The advantages are a reduction in measurement uncertainty, inspector workload, the likelihood of error, and the number of replicas needed by inspectors to assure accuracy. Together with Testex, the manufacturer determined the non‐linear relationship between actual steel profile peak‐to‐valley heights and their replicated heights on tape. By adjusting for this non-linearity, the PosiTector RTR is able to overcome the shortcomings imposed by replica tape foam. Why does the blasted steel under the burnished replica tape appear shiny, and different from the surrounding area? Abrasive blasting often leaves debris on the surface, which changes its appearance. If the surface isn’t cleaned with the included cleaning putty before measuring, the replica tape captures this debris and ‘cleans’ the surface where the tape was burnished. This may make the test area appear ‘shiny’ compared to the surrounding area, and is not a sign of damage to the blast profile. How do you position replica tape into the PosiTector RTR H? Testex Press‐O‐Film replica tape is produced with two positioning dots that align with arrows located on both sides of the PosiTector RTR’s probe. Move the tape to the back of the probe, align the dots, and then press the two probe buttons. Measurement is fast, simple and accurate. Should I purchase the PosiTector RTR or PosiTector SPG for my application? Both instruments conform to ASTM D 4417 "Standard Test Methods for Field Measurement of Surface Profile of Blast Cleaned Steel". The PosiTector SPG conforms to Method B of ASTM D 4417. 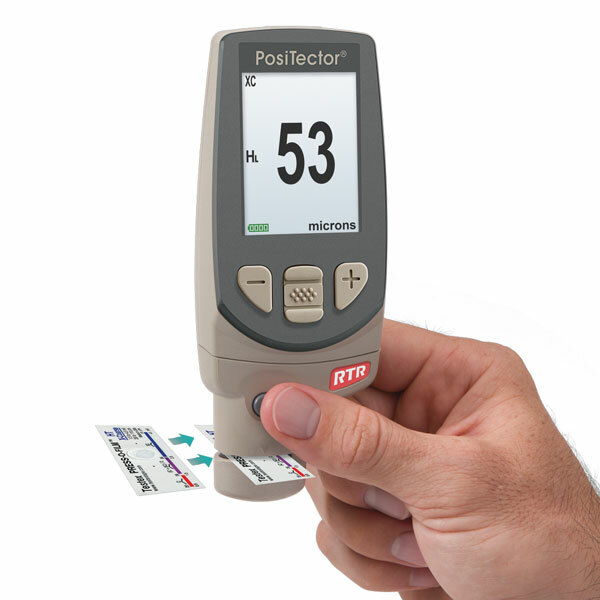 The PosiTector SPG measures quickly, and has no per-test cost. It keeps a digital record of each measurement, is less operator dependent, as no burnishing of replica tape is required. It also has a greater range than replica tape. The PosiTector RTR conforms to Method C of ASTM D 4417. 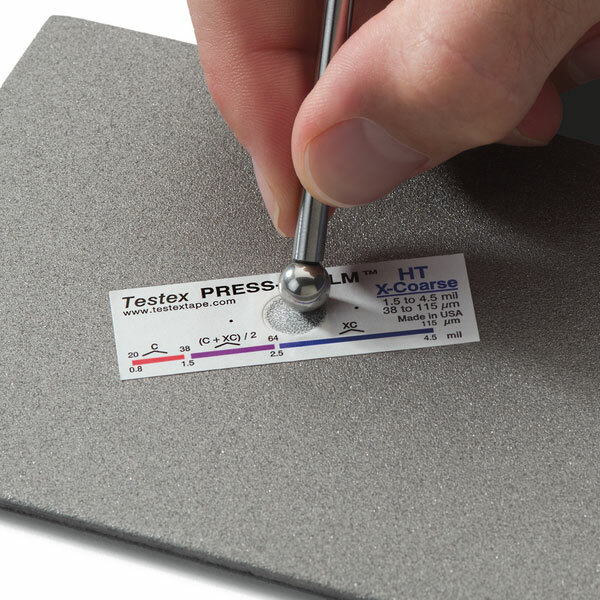 It is used together with Testex Replica tape, a widely used and respected method to measure surface profile. It has the ability to measure on curved surfaces, and gives the user the option to retain the replica tape; a physical replica of the tested surface. What is the spring pressure on the probe? Do I have to apply a specific pressure to the buttons? The anvil impact force of the PosiTector RTR is identical to that of conventional mechanical spring micrometers. The PosiTector RTR has the same anvil size (0.25 inch / 6.25mm diameter) and applies the same spring tension (110 gram‐force / 1.1 Newtons) as Testex micrometers and as required by major test standards. An issue with mechanical spring micrometers is that they can under‐read if a user drops the measuring anvils onto the replica tape too fast. Other errors can occur if the user presses upward on measuring arms to “stabilize” readings. Both actions force conventional micrometers to read lower by crushing the tape’s delicate microfoam. The PosiTector RTR’s unique opposing spring design prevents these undesired user interferences from occurring. Pressing the two probe buttons releases a holding spring. That allows a second spring, the anvil spring, to apply a constant pressure measuring force on the replica. This measuring force is not coupled to the buttons so the user cannot alter the applied pressure and inadvertently influence results. How often should the PosiTector probe be recalibrated? PosiTector probes include a Certificate of Calibration with no expiry or end date. They have no shelf life, therefore the length of time in the field is not a good indicator for recalibration intervals. Many organizations with quality programs and recertification programs require annual recalibrations, and this is a good starting point for most users. Manufacturers recommend that customers establish calibration intervals based upon their own experience and work environment. Based on our product knowledge, data and customer feedback, a one year calibration interval from the date the instrument was placed in service is a good starting point.